In this project, I look to the possibility of unlearning human evolution for manufacturing a future by gaining knowledge from the agency of cockroaches. Being marginalized by humans for thousands of years as creatures carrying diseases, cockroaches bear agency as one of the species that could survive the many extinction events and epochal transformations – the most recent survival project for cockroaches is Biosphere 2. Moreover, the judgment toward cockroaches is built by the hyper-sterilized semiocapitalist idea of a »proper lifestyle« in which overproduction of synthetic commodities and the human disattachment to waste has placed the cockroach as peripheral to the human sphere. Meanwhile, the cockroach is a species that could voluntarily consume excess plastics produced by humans. This project is a science-quasi-fictional quest into the peculiar behavior of the cockroach; constituted as an assemblage of nocturnal, habitable, homeophatic, and nonhuman agency to explore the idea of kinship eco-centric futurism. The artistic gesture of this research is the presentation an exegesis of texts – in the form of theory-fiction, recipes, and codes – and web-based images. 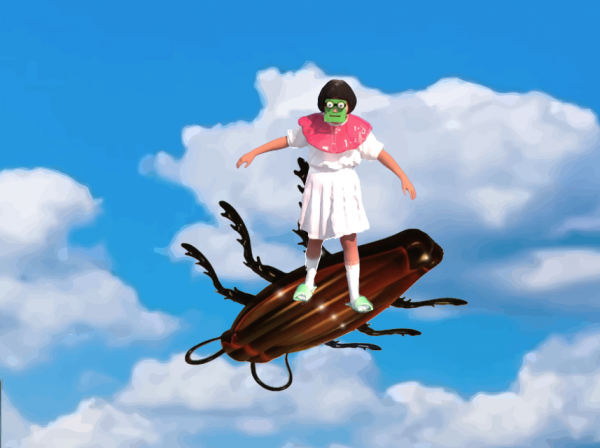 The open-source publication will explore the potential of developing a future involving the cockroach as a symbiotic entity and looking to speculative cosmogony. As the manifesto of Xenofeminism argues, the future is not only for the Child, but it is also a landscape for nonhuman beings.